The decor is based on Egyptian civilization or a particular village, so to get this style of decoration is not complicated at first. 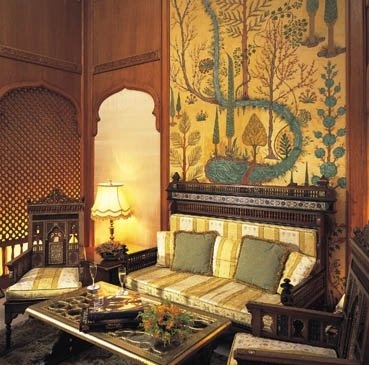 It’s a style that hides a lot of culture decoration, since they were pioneers in using many techniques of painting and introduce many of the materials used today to decorate a home. For example the stucco or plaster technique they were the first who started to use it. The furnishings are simple in structure. Should be avoided as far as possible the light wood furniture and wood in general, and that the Egyptians possessed little raw material for lumber. Chairs or black leather sofas are a good furniture and other furniture such as tables or chairs we can paint in black or gold.Ã‚Â If you have wooden floors must be polished and very shiny. And if it is dark wood better. The colors are a must on these decorations are gold and black, are also included but very subtly earthy colors.Ã‚Â If we opt. to choose a painting technique, the principal would be stucco, or any effect of land using the colors black, gold or land. This entry was posted in Theme Decor and tagged egyptian idea style decor, Egyptian style decor, furniture egyptian, interior egyptian decor. Bookmark the permalink.